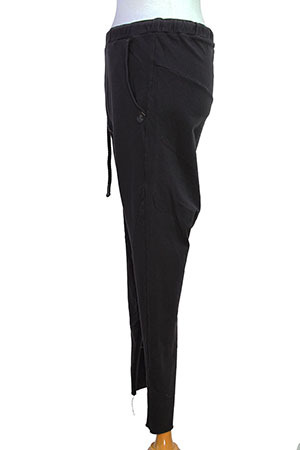 Nostrasantissima thick, stretch, jersey, narrow legged, low-crotch trousers in black. 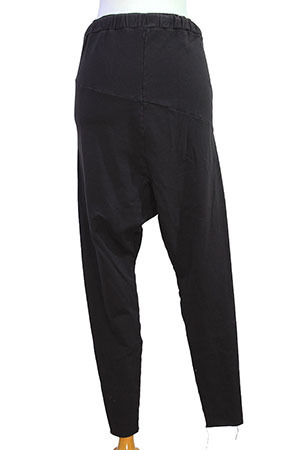 Elasticated waist and heavy drawstring off-centre on right. 2 pockets with trim and the left one has the NostraSantissima emblem sewn underneath. Off-white, diagonal stitch detail on front panels. Diagonal seam details. Raw edged hem on legs. Wonderful trousers, really the button style wise.